Saudi women have the right to vote for the first time in their country. A woman proudly holds up her filled out voting registration form. The first voting day will take place on December 12, 2015. In 2011 King Abdullah (God rest his soul) declared that Saudi women would have the right to vote and run in the municipal elections in 2015. When I first heard the news of women being allowed to vote and nominate themselves I imagine many women felt as I did, overjoyed, excited and, slightly doubtful that the day will come. It’s one thing to have it said, and an entirely other thing to have it happen. 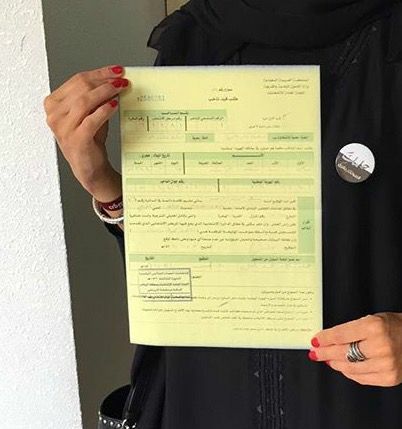 Over the last few weeks women have, for the first time in Saudi history, registered to vote! Every article or news piece I have read about this event has had a ‘however’ attached to the end of it. You won’t find any ‘however’s’ in this one though. Every situation has a ‘however’, but the change that has happened for women in our country over the last ten years alone shows me that these ‘however’s’ right now are just rain on a very well deserved parade. Saudi women are held up to the litmus test of the west that totally ignore (or are ignorant of) the fact that Saudi women have been campaigning for this right and other rights for over a generation. The foreign media also seems to be ignorant about the role society and culture play in these advancements. A message board in Saudi Arabia provides voting registration information for women. The thing people also don’t give us credit for is how hard-working we Saudi women are. And believe us, there is no one more adamant on us getting our rights than ourselves. Small changes are happening that have a big impact on our society’s perception of the role of women outside of the home, in businesses and in government. For the first few months after women joined the Shoura council, during the televised portions, when any of the women were talking, the camera men didn’t know where to focus. Fast forward to a year later, and the cameras are clearly focused on the strong female representatives broadcasting their voices and their faces* clearly. There is not one road block stopping the progress of women’s rights in Saudi, but rather, there are many small holes and bumps and detours to get around and navigate. For the first time since women being granted the right to get an education, we are seeing fundamental change that cannot be taken away from us. It is exhilarating. There has been contagious buzz in the air since registration opened. The Saudi Ministry of Municipal and Rural Affairs (MOMRA) launched a campaign, website and an app with all the information needed to register to vote or run in the municipality elections. 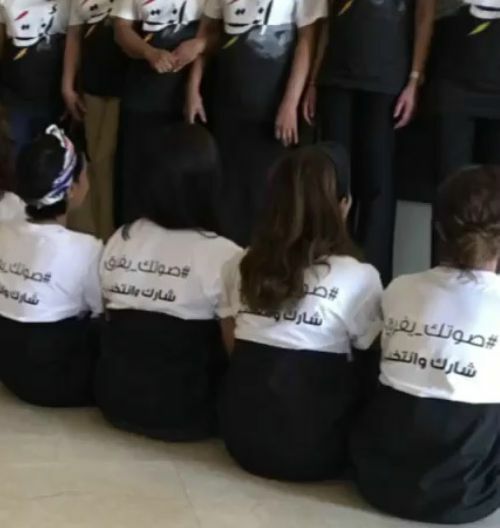 The philanthropic women’s society, Alnahdha, held one of the biggest campaigns to spread awareness around the elections and how to register. They held workshops and partnered up with local businesses and other NGOs to spread the message of “your vote makes a difference” campaign. 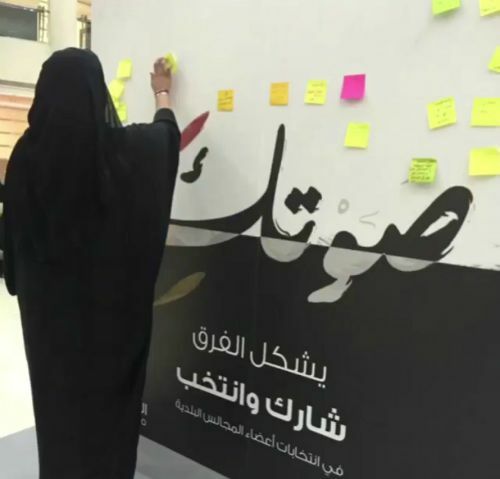 Saudi women taking part in the campaign to spread voter registration information to women. Small business even got on board. Many taxi services such as Easy Taxi and Careem offered free rides for any women who wanted to register to vote. Uber carried flyers and information about voting in their cars. 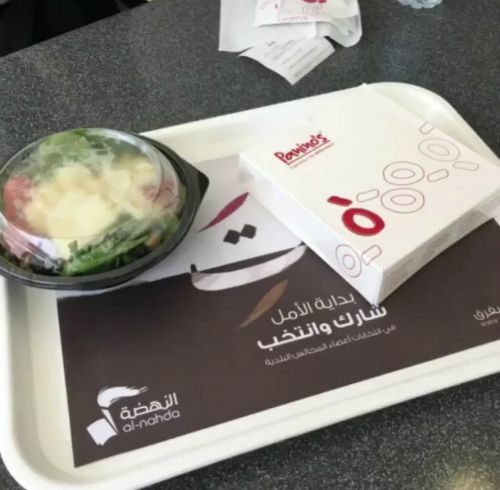 A lunch tray in Saudi Arabia advertises women’s voting registration. Registration closed on the 10th of September, and the vote is on the 12th of December. According to MOMRA 22% of the registered voters are women and 16% of the candidates running are women. 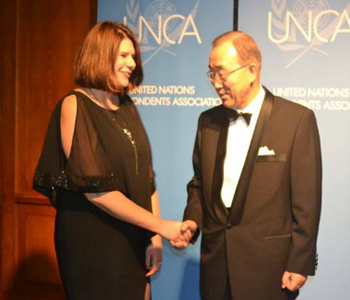 Thinking of my daughter now, I pray that she will be shocked she was alive when women were still not allowed to vote. I pray she can’t imagine what it was like to not have full power over your life and your decisions because of your gender. And for the first time I believe without a doubt that change is not only coming, it is here, just pay attention. It’s moving fast! 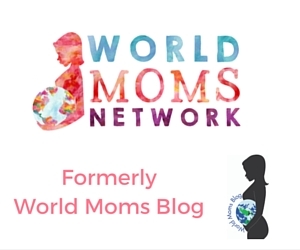 This is an original post to World Moms Blog by World Mom, Mama B. in Riyadh, Saudi Arabia. Mama B’s a young mother of four beautiful children who leave her speechless in both, good ways and bad. She has been married for 9 years and has lived in London twice in her life. The first time was before marriage (for 4 years) and then again after marriage and kid number 2 (for almost 2 years). She is settled now in Riyadh, Saudi Arabia (or as settled as one can be while renovating a house). Mama B loves writing and has been doing it since she could pick up a crayon. Then, for reasons beyond her comprehension, she did not study to become a writer, but instead took graphic design courses. Mama B writes about the challenges of raising children in this world, as it is, who are happy, confident, self reliant and productive without driving them (or herself) insane in the process. Mama B also sheds some light on the life of Saudi, Muslim children but does not claim to be the voice of all mothers or children in Saudi. Just her little "tribe." She has a huge, beautiful, loving family of brothers and sisters that make her feel like she wants to give her kids a huge, loving family of brothers and sisters, but then is snapped out of it by one of her three monkeys screaming “Ya Maamaa” (Ya being the arabic word for ‘hey’). You can find Mama B writing at her blog, Ya Maamaa . She's also on Twitter @YaMaamaa. Good luck on your December 12th elections to you, Mama B., and all of the women of Saudi Arabia. Congratulations on your voting rights, a huge milestone for women!